The Lagos State government has filed fresh charges against a kidnapping suspect, Chukwudumeme Onwuamadike, who many refer to as Evans the billionaire kidnapper. Chukwudumeme Onwuamadike, popularly called Evans, got down from the Black Maria, this time at an Igbosere High Court, with cuffs in his hands. It is barely a week after his trial at the Ikeja High Court was adjourned. He walked with his face down into the court. Evans is familiar with the environment because he was there few weeks ago but for a different trial. 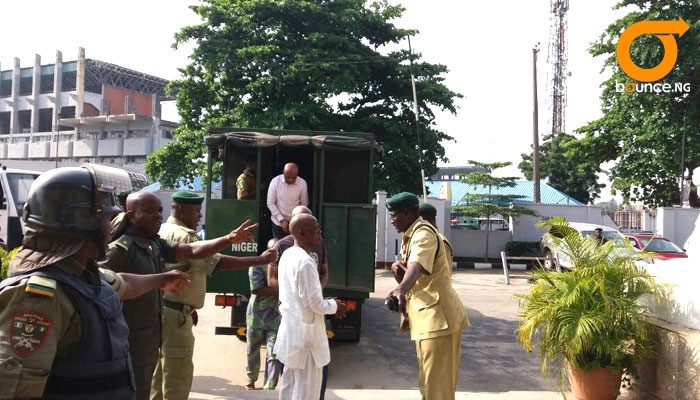 The court room again is full and security personnel are everywhere, as the man also called billionaire kidnapper steps into the trial room to face Justice A.A Akintoye. Fresh charges have been filed against him and four other persons by the Lagos State government. They are facing charges bordering on Kidnapping and attempted murder. The two fresh charges are different from those filed before Justice Oluwatoyin Taiwo and those filed before Justice Hakeem Oshodi, at the same Igbosere court. In one of the charges, the state slammed a five-count charge of conspiracy to kidnap. The last time Evans was at Igbosere court, the Lagos State government filed a seven-count charge and another two-count charge against him and others. The seven-count charge bordered on murder, attempt to commit murder, Kidnapping, attempt to kidnap and sales and transfer of firearms while the two-count charge was for kidnapping and possession of firearms.